Our company covers car key replacement Oakville needs as soon as possible. Did you lose your transponder key? Do you simply want an extra car key made? Rely on us. We offer fast response service and have the equipment required for the replacement and programming of all car keys. Did you lose the Ford key? Want a new replacement for your Toyota? You can depend 24/7 on our Oakville Locksmith Service. Our technicians are auto locksmith experts. We are up to date trained and have knowledge of the most recent changes in the automobile industry. Brands equip their cars with high security systems, which include transponder keys. There are some differentiations among them but the main philosophy with these special keys is hidden in the microchip placed under the plastic cover. It is programmed to communicate with the car’s engine control unit. The car starts only when the ECU recognizes the right key for this particular vehicle. Each car is matched to unlock and start with only one key. So each car key replacement must be cut perfectly and programmed with great accuracy. 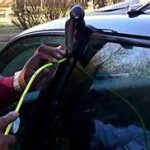 We offer mobile car locksmiths service. Each one of our units carries a big number of tools, cutting machines, key blanks, equipment and software. Our locksmiths have what they need in order to make and properly program any car key. We offer quick response car key service even if the client just needs an extra key. Driving with only one car key with you is too risky. It can be locked inside the car or get lost. Is your car key misplaced? Call us. We provide emergency 24 hour car key replacement in Oakville, ON. Are you locked outside your vehicle? Is the key seriously damaged? We can replace it right away. Call our team even if the transponder key is not damaged but won’t open the door or start the engine. As car key and lock specialists, we can find and fix the problem. When it comes to your car keys, trust the best locksmith in Oakville, Ontario.